London - David Wagner considers Jurgen Klopp to be a member of his family but on Saturday the former will set aside their close ties and hope his Huddersfield side beat Liverpool for the first time since 1959. Wagner's side arrive on a high after beating Manchester United for the first time since 1952 last Saturday which sees them lying in a respectable 11th place after nine matches. 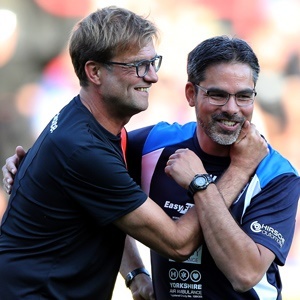 A win over Liverpool would lift Huddersfield above them and increase the pressure that is building on his great friend - who is godfather to one of Wagner's three children whilst the Terriers handler was best man at Klopp's wedding - after a disappointing start to the season domestically. Poor league form - plus an early exit in the League Cup - has left them already 12 points adrift of leaders Manchester City. An ideal weekend for City manager Pep Guardiola would be a win for his team and a draw between Manchester United and Tottenham Hotspur - second and third respectively - who are both five points adrift of the Spaniard's side. Wagner - who was brought in by then head coach Klopp to coach Borussia Dortmund's reserves in 2011 - is downplaying the personal part and highlighting the remarkable rise of his modest club. "It's a great relationship. It's more than a friendship," said Wagner. "Maybe he's more a family member rather than a friend. "But I think the real important and extraordinary story is Huddersfield Town meets Liverpool in the Premier League in a competitive game. "I think nobody should forget this. This is the real extraordinary story. "I don't know for how many years, the last time this football club was able to play at Anfield in a competitive game. This is the big story for us." Aguero's failure to move ahead of Eric Brook's mark of 177 goals against Wolves was blamed by Guardiola on the quality of the ball but the City manager says it is only a matter of time before he does take sole charge of the record. "If not the next game, it's another one. If not, another one. If not, another one," said Guardiola, whose side have already beaten West Brom away this season in the League Cup. "He has to be focused, play football and the situation is going to happen. "It is not a record he has to break by scoring 50 more goals. It's one more goal." Spanish midfielder Ander Herrera - whose remark about Huddersfield playing with more passion infuriated Mourinho - said beating Spurs would put that shock loss behind them. "We want to move forward for a massive game against Tottenham and try to win," said Herrera. "You have to keep the level up because if you drop it a little bit you see what happens. It's a good thing to learn," said Alderweireld. Manchester United v Tottenham Hotspur (13:30), Arsenal v Swansea, Crystal Palace v West Ham, Liverpool v Huddersfield, Watford v Stoke, West Brom v Manchester City (16:00) Bournemouth v Chelsea (18:30).